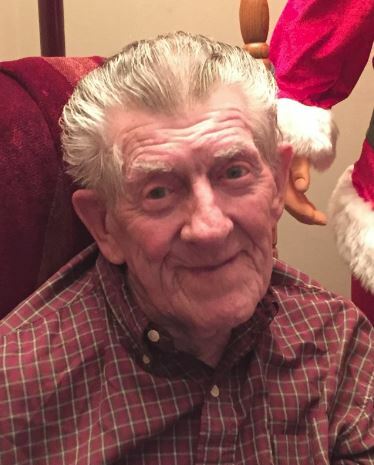 Herbert “Herbie” P. Sifford 98, died Wednesday, March 21, 2018 at Kansas Christian Home in Newton, Kansas. He was born January 12, 1920 in Greer, Missouri to John O. and Elva J. (McGuire) Sifford. On April 9, 1944 he married Ruth Slusser at Wichita, Kansas and she preceded him in death on August 30, 1983. Herbert was a retired from the Santa Fe Railroad after working 38 years. He was a longtime member of the Santa Fe Railroad Union. As a member of Columbus Avenue Church of Christ in Newton since 1955 he was active in the ministry of the church. He helped build their current building and as his health permitted was active though the years in its maintenance. Family was an important part of Herb’s life. He greatly enjoyed spending time with his loving family and many friends. He could often be found enjoying his beloved fast food at local restaurants and especially enjoyed McDonald’s and Taco Bell. Herb started many mornings at his coffee group that met at the Druber’s donut shop where he kept up on the going’s on around town. He is survived by his two daughters: Mary and Michael Hildebrand of San Tan Valley, Arizona and Nancy and Larry Hall of Newton, Kansas. He is also survived by his brother Ernest Sifford of Overland Park, Kansas. He has 5 grandchildren: Kip Hildebrand, Brandon Hildebrand, Jim Hall, Jessica (Gabe) Zapata and Kristy Hall and 8 great grandchildren: Brooklyn Hall, Jake Hildebrand, Connor Hildebrand, Shandi Hall, Jayden Hall, Dylan Miller, Alex Zapata and Olivia Zapata. He was preceded in death by his parents, wife, and brothers Ivan and George Sifford. A celebration of life service will be at 4:00 p.m., Saturday at Columbus Avenue Church of Christ in Newton, Kansas with Minister Buddy Aldridge officiating. Visitation will be 5 p.m. to 9 p.m. Friday at Petersen Funeral Home with the family receiving friends from 6:30 p.m. to 8:00 p.m. at Petersen Funeral Home. Private burial will be in Restlawn Gardens of Memory Rural Newton, Kansas. Memorials are suggested to Columbus Avenue Church of Christ for Leadership Training for Christ in care of Petersen Funeral Home. Rest in peace our dear brother,you were a shinning example to all. Rosie And Larry Thompson Mission Tx. We will miss your smile until we see it again when we join you in Heaven. Rest in comfort Herb and may we never forget the example of love that you were. So sorry for your family’s loss. May your wonderful memories comfort you in the days ahead. Keeping you in my thoughts and prayers. RIP Herb. You are well deserving of it. You’ve impacted so many lives in such wonderful ways – may you be richly rewarded. Love you always. Herb will be missed. His kind heart and friendly smile lit up every room he entered and warmed the heart of each person he encountered. My sincere condolences at Herb’s passing. I always enjoyed his company and great sense of humor. He was a fine man.